Jingle Bells, Jingle Bells, Jingle all the way! Oh, What fun it is to ride...In a one horse open sleigh. Jingle....... Christmas is on its way ... well depending on what time of year you are reading this that is. 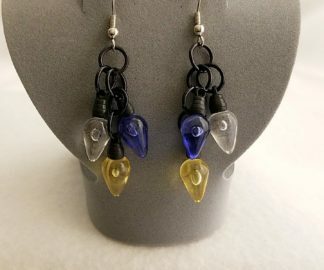 These adorable Christmas Light Bulb Earrings are made from miniature acrylic Christmast Light Bulbs (please note they do not light up). They are Blue, Clear and Yellow in color. 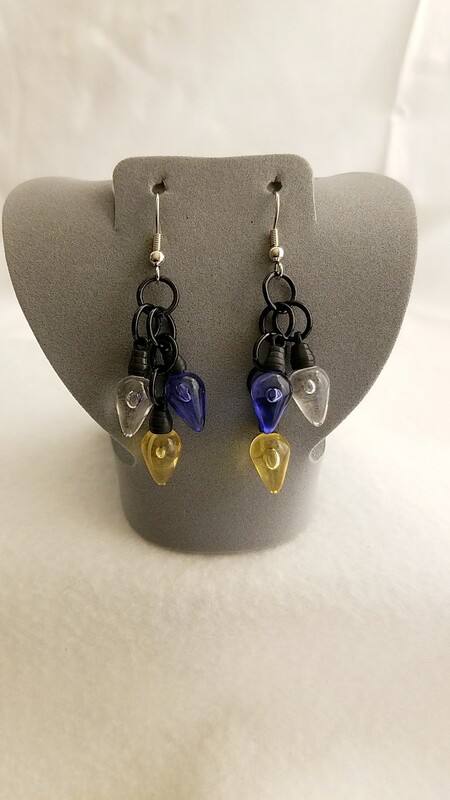 Acrylic - Plastic beads provide a lightweight world of opportunities for jewelry artists. These acrylic beads are available in a wide assortment of vivid colors and fun shapes including designer- favorite faceted bicones, smooth rounds, flowers and alphabet beads. These man-made materials are an economical choice that achieves high impact without a high price tag. Christmas lights (also known as fairy lights) are lights used for decoration in preparation for Christmas and for display throughout the Christmastide. The custom goes back to when we decorated Christmas trees with candles. More of these will be made near Halloween for the upcoming Holiday Season in different colors and styles that will be found on the site. 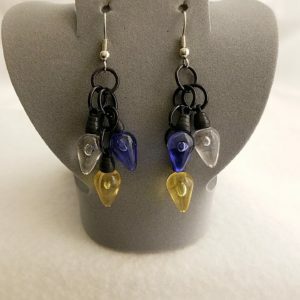 If you would like to know more about the gemstones, rings, and items that are used in making handmade items like this, Christmas Light Bulb Earrings; please take a look at the Material Description Page and my Chain Maille Descriptions page.